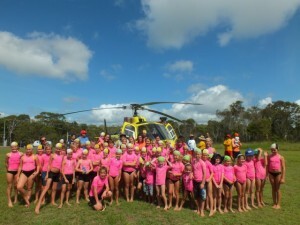 Despite some wild, and plenty of wet weather, it’s been another fun filled season for the nippers. Each of the children who have participated in nippers should have benefited from the program through better safety awareness, surf skills, rescue techniques, first aid/CPR, not to mention the friendships that have developed, and the hours of fun they’ve had. 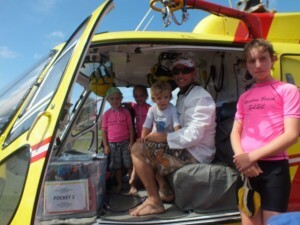 The last day of nippers brought a highlight in the form of a visit from the Westpac Rescue Helicopter. The crew presented an interesting talk for the nippers, and the kids were allowed to sit in and look through the chopper, and talk to the crew, who were happy to answer all of their questions. Thanks to the following Supporters for their Sponsorship and donations toward our breakup: Gympie Printing , QCivil , Thirsty Camel Bottleshop Cooloola, Rainbow Beach Horse Rides, Rainbow Beach Community News, Rainbow Getaway Resort , Cooloola Coast Realty, Sportspower Gympie , Coloured Sands Café, Rainbow Beach Bakery, Deans Ice Works and Rainbow Beach Foodworks. Thanks to key people who’ve contributed to Nippers throughout the season: Age Managers and Assistants, All Water Safety Personnel, Helen Brown, Michelle Gilmore and the Uniform Sales team, Mark Lawler, Tracey Hethorn, Kylie Swain and Justin Schooth. Recognition goes to Codey, Bailey and Kaleb Craig for attendance at 100% of training days. Age Champions for Under 6 (U6) were Sophia Manique and Ryan Sharman. Under 7 (U7) Age Champions were Amassa McPherson and James Duggan. All other Age Champions are listed in their photo caption. Runners Up Taneesha Bradley and Archie Gilmore (U8), Madison Betteridge (U9), Jorja Duggan, Samuel Sharman(U10), Mikaela Keep and James Worthington (U11), Greer Bahr and Brayden McGrath (U12), Codey Craig (U13) and Natalie Cole (U14). Encouragement awards were given to Jade Walker, Kaleb Craig, Lily Wintle, Imogene Betteridge, Billy Bergin, Kyani Parton, Samuel Gooden and Jackson Dawkings. Most improved Indianna Wintle, Tane Bentley, Ellen Manique, Haylee Keep, Jasmine Wintle, Teana Hapi, George Chamberlain and Elizabeth White. Certificates were presented for participation and achieving surf awards. Congratulations to all! 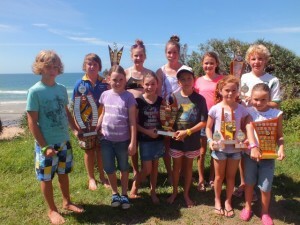 Editor’s Note… Vicki has just handed the reigns over after at least three years of managing nippers. All the parents and the surf club send Vicki a huge thanks for all her hard work and dedication! Jacob and Jade Walker, Marshall with Dad Corey Bradley and George Chamberlain investigate. Thanks guys. I’m impressed it’s only the 1st July and the papers in my mail box already.